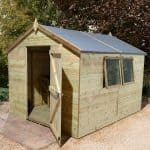 The 10′ x 8′ Traditional Standard Apex Shed has plenty of storage space for you, so much so that this shed works just as well as a workshop as it does a place to keep things off the lawn and the house free from clutter. It is a very secure structure with a door that actually locks so things like bikes and expensive gardening equipment or tools will be safe in here. 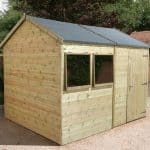 The shed has a very attractive design with its high apex roof standing with pride, smooth walls and lovely horticultural glass windows, this is a shed which really is going to stand out in a very positive way in your garden. The floor and the roof of this shed are made with tongue and groove boards to make them extra strong so the roof can handle the weight of many inches of snow. And the floor is going to be more than up to the job of having very heavy things placed on it. The tongue and groove shiplap cladding and the round edged frame behind it are made from redwood and have been designed so that they last for many years. The very cleverly design of this shed makes it something that is every bit as robust as it is appealing to look at. We have been very happy with this line of sheds from the good folks at Treetops Traditional and the 10′ x 8′ Traditional Standard Apex Shed is one of their larger sheds in this line. Made with very high quality redwood, even from the pictures you can see how great this looks. The depth of the shed is 10 feet and the width 8 which gives you a whole lot of floor space to use. One thing that we love about these types of sheds is the headroom they provide. This one is giving you over 7 feet of height along the ridge and the eaves height is very reasonable also as it is 5 feet 6 inches. We love a good apex roof as it never allows the rain to get inside or even sit up on the roof, it just always flows off. The roof of here is made with 12 mm tongue and groove boards that are then covered with roofing felt. Both the boards and the felt are very high quality, giving you one very strong and impressive roof. 12 mm thick tongue and groove shiplap cladding that is used here is something we have seen Treetops Traditional use before and it has a very striking look to it and also a nice, smooth feel. These walls do give the shed a very attractive look and of course they are up to the task of keeping any water out that will try to get inside. We are certain that you are going to be very pleased with the cladding from a looks and also a practical point of view as well. To ensure that you can put very heavy items in here and walk around without feeling like the floor could give at any moment, there are 12 mm tongue and groove boards used for the flooring. This is the same type of material that is used in the roof and it is just amazing as the weight it can take is just incredible. All the wood will be given a free basecoat treatment which is nice of them to do, but this is only a short term protection for the wood and you will need to coat it soon after construction. The wood will require annual treatment in order to make sure it is protected from the elements. Treetops Traditional give you a one year guarantee with the shed like they do all their others. 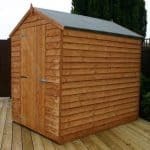 It is not the longest guarantee we have seen, but we do not see you having to make use of it anyway as long as you treat the shed right. Kept in place with three heavy duty hinges and being 5 feet 9 inches high and 2 feet 6 inches wide, the door on here really is ideal in every way. While we really do like the way the door looks, you can actually have them put a stable style door on here if you want to change the look of it a little bit. You also have the option to upgrade it to a double door that is 4 feet wide. This though will add an extra, £53.99 to the price of the shed. The 10′ x 8′ Traditional Standard Apex Shed is going to be very well lit thanks to the fixed windows that are on one side of the shed, letting in lots of natural light. These windows have a very high quality look to them as they are made from thick, horticultural glass which also makes them strong so they can take the occasional hit from a football or Frisbee. The windows can be upgraded so that they can open, but this will cost an extra £31.99 per window. As you have probably noticed from the pictures, the door has a locking mechanism included. We really like this as it keeps everything secure and also means you do not have to go and buy a padlock to lock up the shed. 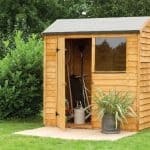 This is not the most private shed we have ever seen, but adding some curtains or even just a bit of fabric over the windows would not be all that much hassle. One interesting thing that Treetops Traditional offer is for you to have no windows and have the shed be fully boarded. As you can change the style of the door and the windows, you do get to have a say in how the shed looks which is something we think is really cool. Also if you want to perhaps brighten up the shed a little bit then try using a bright coloured wood treatment. As well as the double door and the opening windows there are a few more extras that are on offer for you. Their installation service costs £109.99 and will see them actually build the shed for you. Wooden floor bearers can be added at an extra cost of, £52.99 and these will be something to consider if you want to give the floor a little bit more strength and make sure it is lifted off the floor a few more inches. Treetops Traditional have cut no corners here and as a result we are very pleased with the quality of the shed from the top to the bottom. Some people may sigh at the thought of having to treat the shed once a year. Really this is not a lot to do and these materials are selected as they can last for decades, they just need a little care from you to make this happen. It may need a large space to be installed in, but the storage space on offer here for the price they are asking is pretty incredible. This is a two person job so be sure to put on a smile and have a tin of biscuits in hand when you ask someone. This is not a terribly hard DIY job thanks to the design and the instructions and it should take you around 4-6 hours. While you can get sheds of a similar size for a cheaper price, the materials used here do make this worth the extra money. 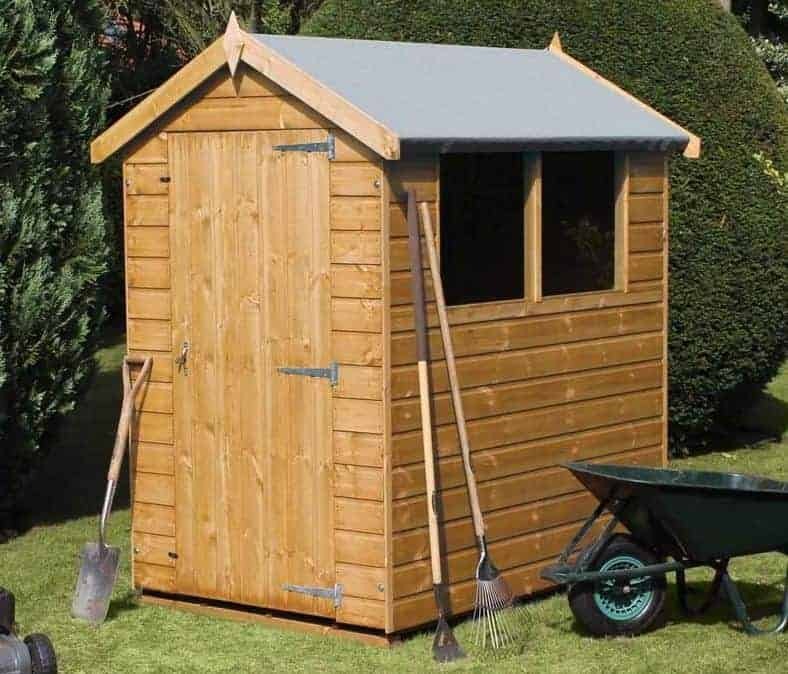 Final Thoughts: The 10' x 8' Traditional Standard Apex Shed has a wonderful look to it that we feel is not over the top so it is going to fit in any style of garden. With 10 feet of depth and 8 feet of width the storage space that you have to use is amazing and will see you having a great time organising your tools and gardening gear or even just getting rid of some of the clutter from the house and the kids toys that are always scattered over the garden. 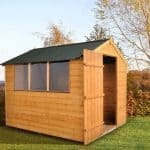 We really do like this shed and think as the materials will last for such a long time it is well worth the price that it is. 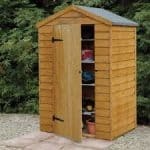 So if a large shed is what you are in the market for this is one that we highly recommend you consider.